We were delighted to be ‘Highly Commended’ in the Bristol Life Award’s Business Services category at last night’s ceremony, on 11th April 2019, celebrating the very best of Bristol’s businesses. It is a fantastic achievement to be recognised amongst an impressive range of local companies, from charities to corporates. The Business Services category had over 40 entries, with 11 shortlisted companies, so SETsquared Bristol are honoured to receive this recognition. Our Alumnus, One Big Circle, were also nominated in the Best New Business category, and our partners, Unit DX, for the Technology and Innovation award. 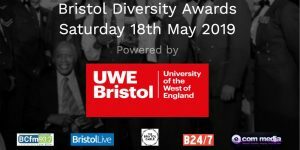 Over a thousand nominations for the Bristol Diversity Awards from the public have been narrowed down to just 3 contenders in each category, with the winners being announced at the ceremony on Saturday 18th May at Mercure Holland House.